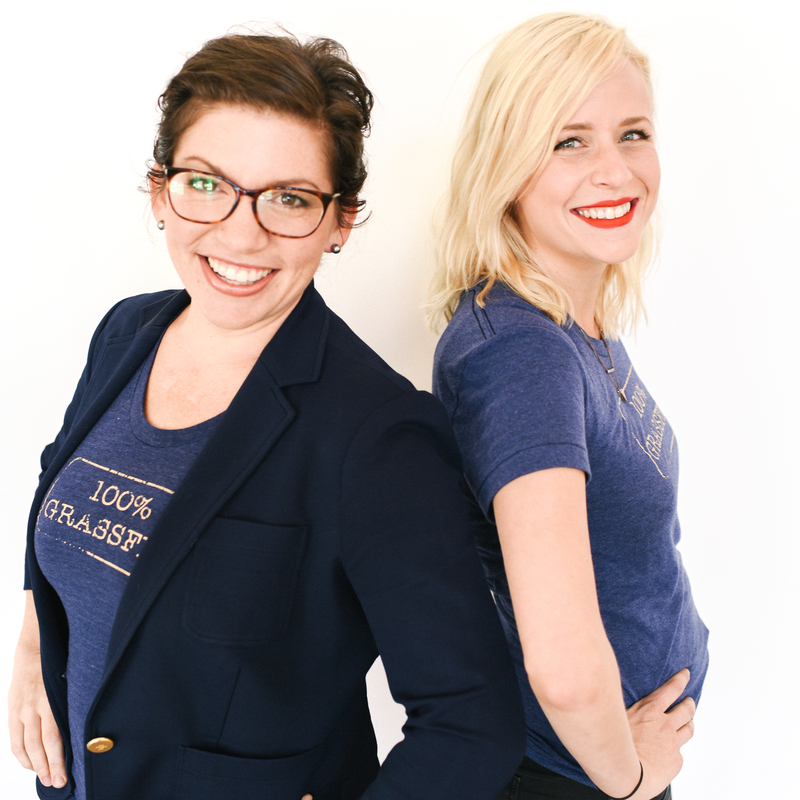 At Engaged we’re all about love — celebrating it, and sharing it! We’re a tight knit family of creatives, that’s for sure, but we’re also really connected with the greater community here in Asheville, North Carolina. From collaborations to partnerships, we love working with all the wonderful venues and vendors, movers and shakers we share a home with here in the mountains! Speaking of, it’s just about impossible for us to overstate how much we love living here nestled in the beautiful Blue Ridge Mountains. 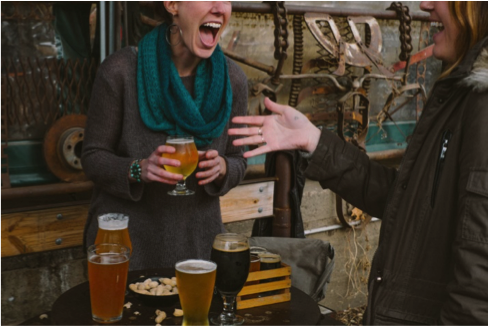 The natural beauty, the rich history, the thriving culinary scene…and, of course, the plethora of breweries that won Asheville its “Beer City” moniker. With so much to love here in western North Carolina, it’s easy to see why couples, their families, and friends choose our gorgeous mountain town for their wedding destination. When our couples begin planning the festivities for their wedding, they always want to show their guests the best of what this city has to offer. 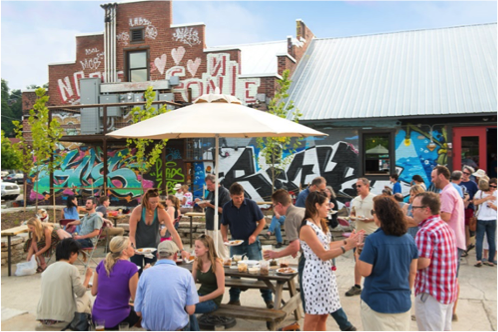 From wedding favors to rehearsal dinner sites, we love exploring new ways for both locals and out-of-towners to experience Asheville! 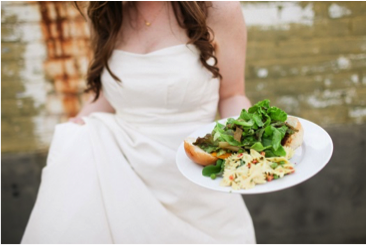 Our creative team members from Farm Burger are seasoned pros in catering private events for wedding parties at Asheville’s most sought-after spots, including breweries! 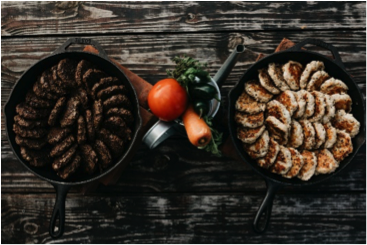 With so much insight to share, the Farm Burger team is letting us (and you!) in on their top three brewery event spaces that will wow your wedding guests. After a sunny stroll through the River Arts District, your guests can meet you at Wedge Brewing’s newest location that features both indoor and outdoor seating. The private event space, called The Cloud Room, is a fantastic space for guests to enjoy a bite and a beer either indoors in the cool A/C, or outdoors taking in the fresh mountain air. Moving from the interior private bar to the outside patio where there is ample seating is a smooth transition that encourages easy crowd flow. Our favorite part, though, may have to be the solid collection of outdoor games to keep guests of all ages entertained. (Let’s just hope Uncle Bob takes it easy with his ping pong competitive streak!). 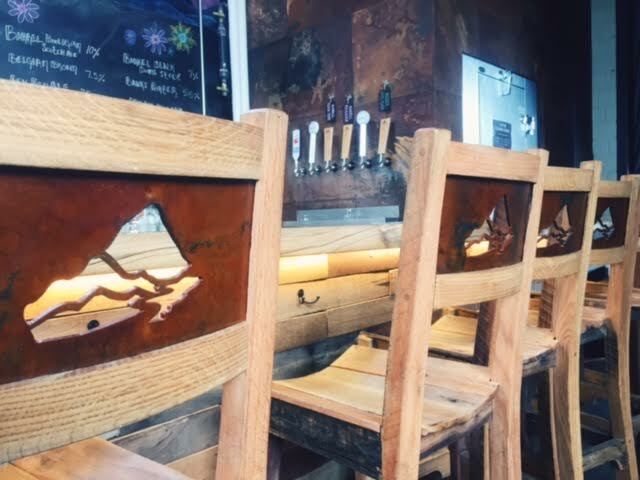 Highland Brewing played a key part in cementing Asheville’s status as a beer haven, putting our mountain town firmly on the beer map with their delicious, creative brews. Their commitment to sustained excellence continues with their latest endeavor, The Event Center, a three-story space featuring a private stage and a rooftop bar. Gorgeous architecture and sprawling views are just two more things on the list of things we love about The Event Center! It makes the perfect venue for large parties as it can accommodate up to 400 guests. Still, we caution our couples not to worry about inviting their entire high school graduating class…even if they will see it on Facebook the next day. Location, location, location! 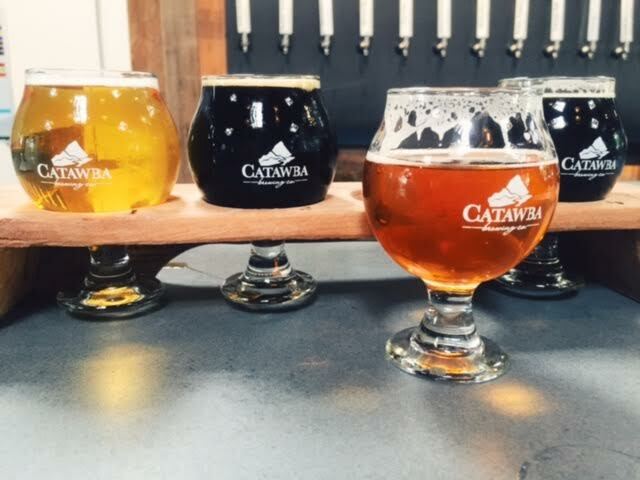 Catawba Brewing’s spot in downtown Asheville’s South Slope positions it nicely for guests to get to easily from their hotels or after exploring the vibrant downtown scene. The private event space within the brewery has a live, energetic feel that is sure to rub off on your guests. Sunlight pours in through windows and skylights, bouncing off of crystal chandeliers that add a glam-eclectic aesthetic to the stacks of aged wooden barrels. If beer doesn’t float everybody’s boat, guests can sneak next door to Buxton Hall Barbecue for a boozy bourbon and Cheerwine slushie and return before anyone notices. (Shhh…we promise we won’t tell! We’ll meet you over there!). 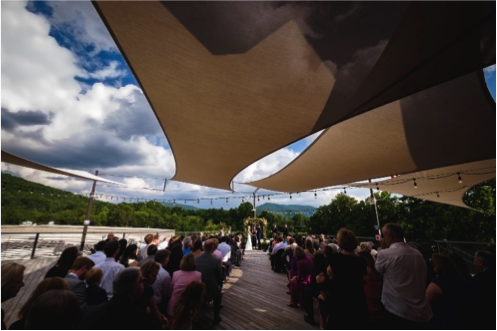 Between the libations and the primo location, Catawba South Slope is the perfect place to wrap up your wedding event before setting out for the next Asheville adventure. While it would be nearly impossible to name a favorite beer with so many amazing options here in town, we do love the above three breweries for both their suds and their event spaces. 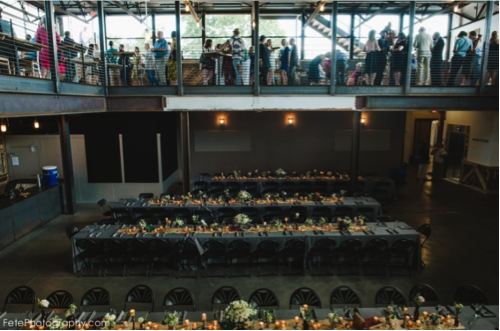 Hosting an engagement party or rehearsal dinner at one of these private spaces is the perfect idea for gathering your friends and family together in a relaxed environment while showing them a taste of what Asheville has to offer. 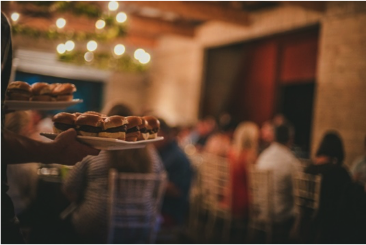 Our Farm Burger catering team is very familiar with all of these event spaces and is ready to help you customize the perfect menu to complement the beer served at each brewery. After all, a burger and a beer may be the original power couple! For any questions about Farm Burger Catering please contact Eric Richard at erichard@farmburger.com or (828) 785-4880. To learn more about Farm Burger and their catering services, please visit their website. You may also refer to their profile our Creative Team page.